The water bottle, re-imagined. Re-engineered. With a stylist. A bulky camping canteen no longer, now a sleek, portable hydration vessel. Not only providing liquids on the go, also a gleaming fashion accessory. All this while saving the planet from plastic waste and providing clean water to those in need. 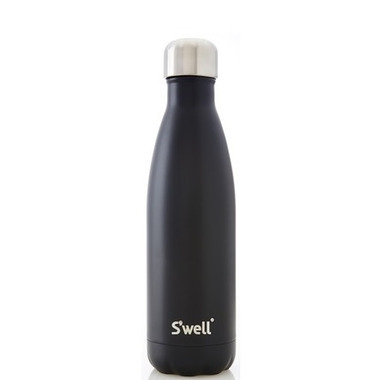 S’well bottles are elegant and useful. Portable and chic. Double walled, insulated construction allows beverages to stay hot or cold for a long time. Constructed of the highest quality stainless steel (18/8 food grade), these bottles are non leaching, toxin free, virtually unbreakable, yet lightweight, with a wide mouth to allow for easy cleaning, adding ice cubes and most of all, enjoyable drinking. S'well donates 10% of all sales to building safe and hygienic water sources in Africa and India through a partnership with WaterAid. This is my second S'well, a baby brother to my large Pomegranate one. It too, keeps beverages cold... and/but fits in my purse. The black is classy... take it, "wear it" anywhere!